We have carefully assembled a team of competent and caring dietitians who have dedicated their careers to improving their clients’ health and wellness. While they are each a passionate leader in their own areas of dietetic practice, they share an insatiable desire to keep learning more in this ever-evolving field of nutrition. I am a proud farmer's daughter who grew up in the small rural town of Baden, located in southwestern Ontario. From a young age my sisters and I helped with chores on the farm and planting, weeding and harvesting in my mom's large garden. Although at the time I didn't realize it, growing up on a farm where I took part in my own "farm to fork" experience planted a seed in me which would later blossom into my future career path as a dietitian. Fast forward to university, I attended McMaster University where I obtained a Bachelor of Kinesiology degree and then moved onto the University of Guelph where I completed my Bachelor of Applied Human Nutrition, followed by a dietetic internship with Hamilton Health Sciences Corporation. The majority of my clinical nutrition experience took place at McMaster Children’s Hospital in Hamilton Ontario in neurology, growth and development, and oncology outpatient clinics. I also enjoyed a short stint at a Family Health Team in Kitchener where I was able to support patients of all ages and nutritional concerns, including chronic disease management. Originally from Winnipeg, I first developed an interest in nutrition as a high school runner and grew passionate about how whole foods can best nourish and fuel the body. I've always had an interest in cooking and discovering new cuisine, which was fueled by traveling and living abroad, and growing up in a close-knit family that loved to cook & enjoy great food together. I went on to complete a Bachelor of Science degree in Human Nutritional Sciences from the University of Manitoba, and then made the move to southern Ontario to complete the Master of Applied Nutrition Program and Dietetic Internship at the University of Guelph. Years later, I am even more passionate about helping people reach their healthy living goals and fuel their body with proper nutrition to live well, perform strong, enjoy food, and live an energized life. Most of my career has been spent in primary care, working in family health teams and seeing clients for a variety of conditions. Alongside that, I have a private practice specializing in sport & performance nutrition. Blueprint Nutrition seeks to blend the art and science of nutrition and healthy eating to help clients make informed, evidence-based decisions about their health. Blueprint Nutrition strives to become the center of excellence for nutrition services in Waterloo Region by providing exemplary health care rooted in its values of integrity, authenticity, and compassion. Food that grew in a garden, on a tree, or perhaps came from an animal. Eating more plants is undoubtably important for our health and we are happy to show you how to do that! A healthy way of eating includes some chocolate fudge brownies and poutine! We want to help you achieve sustainable and realistic ways of eating that DO NOT include shame, guilt or starvation. We see you for who you are and all of the beauty and talents that you bring to humanity. You are not your weight. Cooking is important to leading a healthy lifestyle. We believe there is abundant value in passing this skill onto the next generation - we like to call this “food-u-cation”. 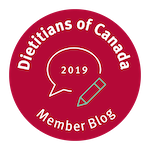 Registered dietitians have 5+ years of university education and clinical training in nutrition. “Science-y” is not the same as “science”. Nutrition research is not perfect but let us interpret it for you and give you the ‘why’ behind the ‘what’. We use a collaborative team approach in our feeding therapy team, and also offer to communicate our nutrition assessments and recommendations to your physician(s) or other allied health care practitioners.